Another EXCHANGE of ideas was with Thomas Edison. Soon after Tesla got to America he went to work for Edison. Even though they had competing ideas they helped each other. Tesla learned more from Edison and Edison got help from Tesla. "Tesla and Edison, by virtue of working together in Edison’s lab, certainly helped each other. Tesla learned something about life and work in America. Edison gave him his first job in this country. Edison profited by Tesla’s work. Edison’s DC motor was improved by Tesla, and he had the benefit of a hardworking employee." " I have had many hardworking assistants but you take the cake." 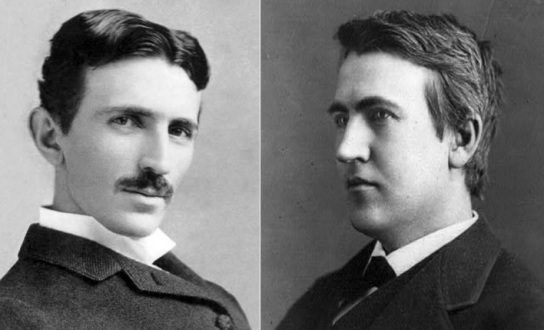 "I have noticed the same unconscious quality of personal magnetism in Mr. Edison, though in almost every other respect these two remarkable individuals [Edison and Tesla] are totally dissimilar." — Walter T. Stevenson, Outlook magazine, 1895.
" The young Serbian electrician derived a fresh stimulus and lasting benefit from his association with Thomas A. Edison." —Walter T. Stevenson, Outlook magazine, 1895. — Marc Seifer, author of ​Wizard: The Life and Times of Nikola Tesla, Biography of a Genius.